The notion of entrepreneurship has attracted considerable interest within management and business since its first appearance in 1437 (Westhead & Wright, 2013; p. 4) and its more popular and common use through the pioneering writing of Jean-Baptiste Say (1803). Yet, while entrepreneurship seems to imply novel projects and undertakings in challenging new contexts, it is very seldomly invoked in project management dialogues. One might have expected the relative proximity between the disciplines to have resulted in greater commonalities and sharing, however in reality the project management community has remained somewhat oblivious to advances in entrepreneurship and to the potential for inter-disciplinary collaboration. Entrepreneurship has been associated with the creation of something new or different, including new enterprise (Lumpkin & Dess, 1996), new organisations (Low & Macmillan, 1988), as well as new ventures, new markets, and new opportunities (Read et al., 2017). Shane & Venkataraman, identify entrepreneurship as ‘the scholarly examination of how, by whom, and with what effects opportunities to create future goods and services are discovered, evaluated, and exploited’. (2000; p. 218). the behaviours required by entrepreneurs. Entrepreneurship can therefore be perceived as a synthesis of the three dimensions, for example, by observing the behaviours undertaken within and alongside the processes of discovery, development and exploitation related to new ventures with a focus on value and outcomes. In the wake of the Second World War, project management was entrusted with a significant range of intricate and demanding undertakings, often requiring the integration of complex components, sub-systems, systems, projects, programmes and specialisms (Dalcher, 2015; p. 1). Many of the new initiatives were ambitious, unprecedented, and extremely innovative requiring an entrepreneurial mindset, and a systemic approach to match the rising ambition and complexity levels. 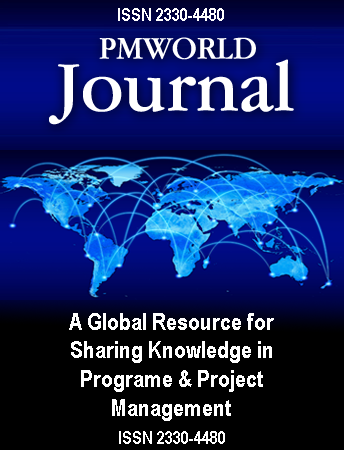 Editor’s note: The PMWJ Advances in Project Management series includes articles by authors of program and project management books published by Gower and other publishers in the Routledge family. Each month an introduction to the current article is provided by series editor Prof Darren Dalcher, who is also the editor of the Gower/Routledge Advances in Project Management series of books on new and emerging concepts in PM. Prof Dalcher’s article is an introduction to the invited paper this month in the PMWJ. Darren Dalcher, Ph.D., HonFAPM, FRSA, FBCS, CITP, FCMI, SMIEEE, SFHEA is Professor in Strategic Project Management at Lancaster University, and founder and Director of the National Centre for Project Management (NCPM) in the UK. He has been named by the Association for Project Management (APM) as one of the top 10 “movers and shapers” in project management and was voted Project Magazine’s “Academic of the Year” for his contribution in “integrating and weaving academic work with practice”. Following industrial and consultancy experience in managing IT projects, Professor Dalcher gained his PhD in Software Engineering from King’s College, University of London. Professor Dalcher has written over 200 papers and book chapters on project management and software engineering. He is Editor-in-Chief of Journal of Software: Evolution and Process, a leading international software engineering journal. He is the editor of the book series, Advances in Project Management, published by Routledge and of the companion series Fundamentals of Project Management. Heavily involved in a variety of research projects and subjects, Professor Dalcher has built a reputation as leader and innovator in the areas of practice-based education and reflection in project management. He works with many major industrial and commercial organisations and government bodies. Darren is an Honorary Fellow of the APM, a Chartered Fellow of the British Computer Society, a Fellow of the Chartered Management Institute, and the Royal Society of Arts, A Senior Member of the Institute of Electrical and Electronic Engineers, a Senior Fellow of the Higher Education Academy and a Member of the Project Management Institute (PMI) and the British Academy of Management. He is a Chartered IT Practitioner. He sits on numerous senior research and professional boards, including The PMI Academic Member Advisory Group, the APM Research Advisory Group, the CMI Academic Council and the APM Group Ethics and Standards Governance Board. He is the Academic Advisor and Consulting Editor for the next APM Body of Knowledge. Prof Dalcher is an academic advisor for the PM World Journal. He is the academic advisor and consulting editor for the forthcoming edition of the APM Body of Knowledge. He can be contacted at d.dalcher@lancaster.ac.uk. To view other works by Prof Darren Dalcher, visit his author showcase in the PM World Library at http://pmworldlibrary.net/authors/darren-dalcher/.